There’s one habit that I promote to all my clients to develop and that is to drink enough water to stay hydrated all day. The benefits of staying hydrated are numerous for both body and mind and it’s not just beneficial in the summer months but all year round. Fatigue – Water is the best conductor of electricity for producing energy in the body. Without enough water, the enzymes cannot do their job to remove lactic build up in the muscles, which can cause one to feel tired. Headaches – Most headaches are caused by dehydration. The brain is 80% water. High Blood Pressure – The blood is 80-92% water, if there is not enough water, the blood can become too thick, causing slow movement through the arteries. Allergies – The body will produce too many histamines in order to conserve water, constricting airways and making it hard to breathe. Skin disorders – Skin is 64% water. Dry skin, premature wrinkles, rashes and acne may result from lack of water. Digestive disorders – When there is a lack of water and alkaline minerals, digestive issues such as acid reflux, ulcers, and irritable bowel syndrome can develop. Kidney and bladder issues – Lack of water can create kidney stones, urinary tract infections, gout and pain because of the buildup of uric acid and bacteria not flushed out. Constipation – This is not just an inconvenience, but a dangerous situation. The expansion of the colon and intestines from packed stool can cause perforations, leaking toxins into the blood stream. We are constantly told in the media to drink plenty of water. In fact, the recommended amount of water one ought to drink per day is ½ of your weight in ounces of water. A person weighing 150 lbs needs to drink at least 75 ounces/2.2 litres of water per day. Synergy’s premiere health enhancement product ProArgi-9+ is manufactured using state-of-the-art equipment after it’s tested hundreds of times. Each batch of ProArgi-9+ is tested for contaminants down to the parts per trillion. One of the primary ingredients in ProArgi-9+ is l-arginine, which was researched by three American scientists who were awarded the Nobel Prize in 1998 for discovering its powerful health benefits. 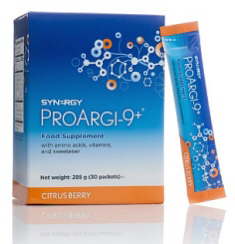 ProArgi-9+ contains five essential vitamins: Vitamin C, Vitamin D3, Vitamin K, Vitamin B6 and Vitamin B12. Each plays a vital role in supporting the body’s overall performance. Vitamin C contributes to the normal functioning of the nervous and immune systems while reducing fatigue and contributing to normal psychological function. Vitamin B6 and B12 share a few health benefits with Vitamin C, but also play an important role in normal red blood cell formation and homocysteine metabolism. Vitamin K has a set of its own benefits, playing a key part in maintaining normal bones and blood coagulation.